Kataway is named after the beautiful bay the house overlooks on Myall Lake. Kataway is situated on a private road offering uninterrupted views over park like gardens to Myall Lake at the front and unspoilt wooded hillside views from the rear of the house. Kataway is a double story house featuring large open plan living spaces with timber and sisal flooring and high cathedral ceilings. In the heat of the summer Kataway is light and bright catching the breezes off the lake. The living spaces open onto a huge deck that allows you to take in views of the garden and the lake. Passing kangaroos and even the occasional koala can sometimes be spotted too. The deck is furnished with timber lounge chairs & a great dining bar table with market umbrella. Its a great spot for breakfast, and afternoon nap or sunset cocktails. The Webber bbq is out there too. After a hard day on the lake, at the beach or exploring the surrounding countryside, it is comfort that you want and this is what you get at Kataway. There are several separate relaxing areas for friends, family and children. The decor is an eclectic mix of 50's style, French provincial, artworks and quirky decorative touches, huge comfortable sofas to stretch out on and plenty of armchairs to curl up on. On cold winter nights gather round the wood burning combustion stove in the main living area and with oil fired radiators in every room, Kataway stays warm and cozy through the cooller months. Upstairs and downstairs each have their own TV areas which include widescreen tvs, dvd and dvd collections. Cd player, CDs radio etc. light snacks through to full dinner parties. There is a gas stove top with electric range and grill, microwave, fridge/freezer a Nespresso coffee machine (you will have to take your own Nespresso coffee pods to use) and a Webber gas bbq for cooking the freshly caught seafood (from the fish co-op if its easier). There is also an outdoor fireplace/bbq area which is a great spot to stargaze from. Kataway offers a peaceful master bedroom with king size bed and fabulous views over the garden to the lake. Built in robes offer plenty of storage space. The second guest room offers queen size bed and scenic views of the wooded hillside at the rear of Kataway. The 2 main bedrooms share a spacious bathroom with separate shower and bathtub. Downstairs you will find a huge rumpus room with comfortable sofa, armchairs and dining setting, ideal for the kids to escape to. Adjoining the rumpus room is a huge twin double bedroom with sliding doors onto the garden. The downstairs accommodation is serviced by an ensuite shower room with toilet plus a separate laundry with frontloader. Kataway is a fantastic holiday home to make your own when on holiday. It is ideally located for you and your guests to enjoy the sights and sounds of Seal Rocks and the Great Lakes or to be used as a comfortable base for exploring the surrounding beaches, lakes and attractions. Whatever option you choose, Kataway makes the perfect getaway. Kataway is a home to enjoy and be comfortable in. Many of our guests are repeat and comment on how they feel like they are staying at a good friends or a well loved relatives home. We hope that you will enjoy staying at Kataway too. Kataway is situated 1.81km from the Lakes Way. 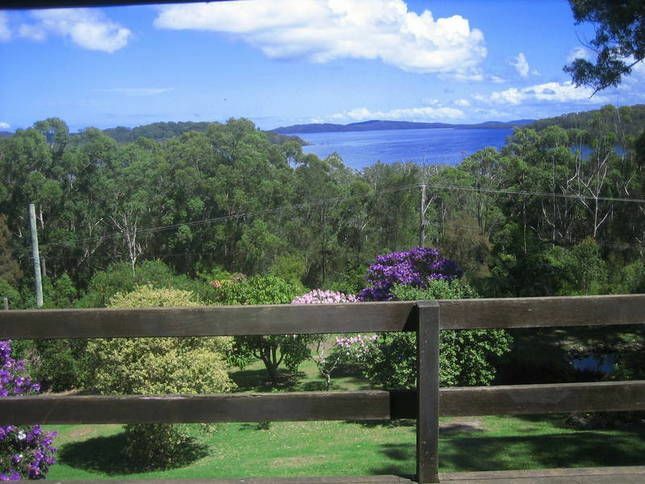 Kataway is set high on a hill overlooking Myall Lake above Seal Rocks Road and bordered by national park. The main attraction of Kataway is the house and its park like gardens bordered by national park. This is a house for some serious relaxation. Add to this the fantastic view of Kataway Bay on Myall Lake and the high level of comfort and convenience offered within the house. Seal Rocks beach is only 7 minutes away by car. Smiths Lake and Myall Lake are a pleasant and easy short walk away. Further afield are Sand Bar, Blueys, Boomerang and Elizabeth beaches for swimming, surfing or just soaking up the sun. Beyond that Forster and the Great Lakes National Park offer a huge variety of attractions and activities all year round. Property was great and plenty of room for 8 people. We had a wonderful time at Kataway, highly recommended. The house is very spacious and beautifully decorated. The kitchen is fully equipped with a large variety of appliances - including three types of coffee machines :). It has a west-facing breathtaking view over Myall Lakes from the outdoors deck where a late afternoon session is a "must". Secluded Shelly beach is also close by - A beautiful short stroll through the forest to reach one of the nicest spots in the area. The walk to the lighthouse is also near by as well as many other beaches. This property is definitely on the " to come back" list! Thank you Nathaniel & co for making this stay so memorable. We had a great time showing our Swedish relatives what the area has to offer, house was very spacious with magnificent views over the lake, can’t wait to stay here again. What a wonderful place for a break! the house has a homely atmosphere and an accommodating array of books, movies and boardgames for the family to enjoy. The house was clean and well appointed, and the expansive gardens are tranquil picturesque...great for birdwatchers.